Revealed associations between nicotine, alcohol, and marijuana use during two periods of adolescence and smaller gray matter volume in two brain areas at age 25. Supports a hypothesis that as the brain matures during adolescence, it passes through stages in which it is particularly sensitive to substance exposure. Dr. Michael Windle at Emory University and colleagues from other institutions performed magnetic resonance imaging of the brains of 110 25-year-old African Americans. The young men and women had participated in a study of Strong African American Families, a program designed to reduce the impact of childhood poverty on rural African Americans. During the study, they had reported their substance use to researchers annually from age 11 to 21. The researchers found that higher levels of alcohol, cigarette, and marijuana use before age 19 correlated with smaller gray matter volume in two brain areas (see Figure). The amygdala was smaller in youths who had reported higher use of the substances at ages 12 to 15. The pars opercularis, a subregion of the inferior frontal gyrus, was smaller in those who reported higher use of the substances at ages 16 to 18. To the researchers’ knowledge, theirs is the first study to show a relationship between substance exposure and the pars opercularis. Figure. Substance Use at Different Times During Adolescence Is Associated With Decreased Volume of Specific Brain Areas in Young Adulthood Substance use in early adolescence was associated with significantly smaller volumes in the left and right amygdala, which are involved in emotional processing, at age 25. Substance use in middle adolescence was associated with significantly reduced volume in the left pars opercularis, which is involved in cognitive control. No significant associations were found between cannabis use at ages 19-21 and brain volumes at age 25. The location and timing of the observed associations parallel the staged maturation of the adolescent brain, in which emotional circuits come fully online prior to cognitive circuits. The amygdala is part of the limbic system, which matures earlier and is strongly implicated in emotional responses, especially fear. The pars opercularis is part of a forebrain circuit that matures later and supports the ability to refrain from impulsive behaviors. Came about because the drugs inhibited the developmental expansion of gray matter volume in the affected areas. Both etiologies might also pertain. To resolve the issue, researchers will need to conduct a longitudinal study in which they obtain brain images before adolescence, collect substance use data throughout adolescence, and obtain follow-up images after adolescence. The researchers also looked at gray matter volume in the ventral striatum. They found no link between substance exposure and gray matter volume in that area, but speculate that a link might emerge in a study with more participants. This study was supported by NIH grant DA027827. Windle, M., Gray, J.C., Lei, K.M., et al. Age sensitive associations of adolescent substance use with amygdalar, ventral striatum, and frontal volumes in young adulthood. Drug and Alcohol Dependence 186:94-101, 2018. NIDA. "Research Links Adolescent Substance Use to Adult Brain Volumes." National Institute on Drug Abuse, 10 Apr. 2019, https://www.drugabuse.gov/news-events/nida-notes/2019/04/research-links-adolescent-substance-use-to-adult-brain-volumes. NIDA. Research Links Adolescent Substance Use to Adult Brain Volumes. National Institute on Drug Abuse website. 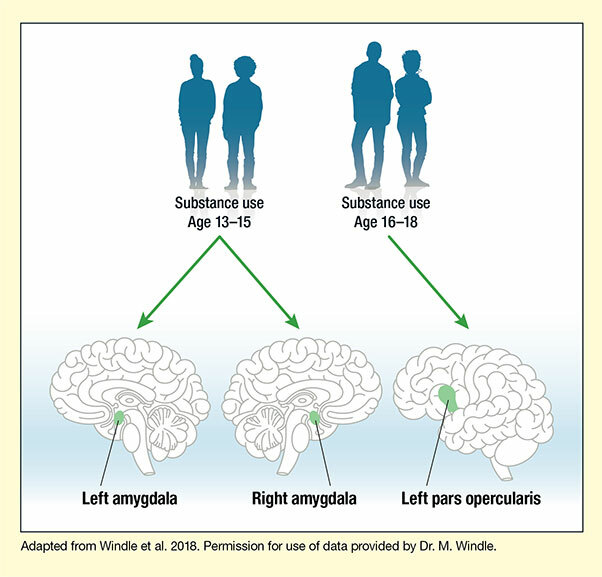 https://www.drugabuse.gov/news-events/nida-notes/2019/04/research-links-adolescent-substance-use-to-adult-brain-volumes. April 10, 2019.